Home Unlabelled Here Is Why You’re Bloated All The Time And The Solution How To Fix It! 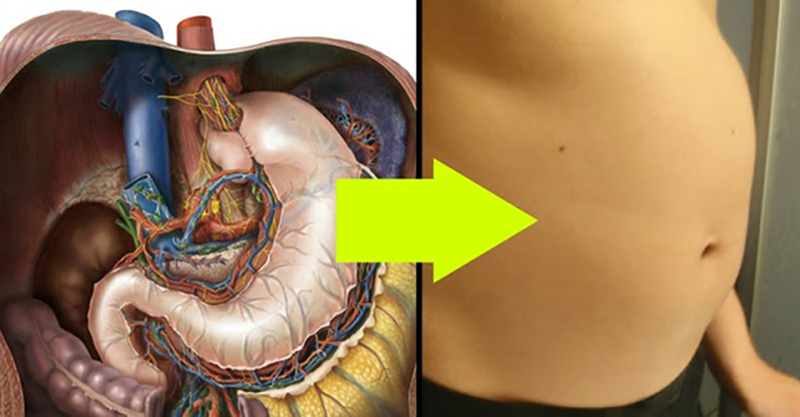 Here Is Why You’re Bloated All The Time And The Solution How To Fix It! That bloated feeling is hard to endure for some. They experience it all the time. Maybe you just experience it once or twice a month after a meal. For some people, though, they feel bloated most of the time. Let’s look at the top five reasons why people feel bloated all the time. Then, we’ll take a look at what you can do to fix the problem. Bloating means different things to different people. To some, it means burping too much. To others, it means farting too much. Some people describe it as their stomach feeling just a little too full. Some people think that bloating is just an appearance thing. Their belly looks popped out or pregnant, they say. The clinical definition of bloating has to do with gas being trapped in the abdomen or the abdominal distension that a doctor observes. Here are 5 things that could be causing you to feel bloated all the time. Some people say that a low-carb diet helps them with their bloating problem. Poorly digested carbohydrates could be causing you to feel bloated, too. Figuring out if sugar, alcohol, or starches is causing bloating might just help you nip it in the bud. Try replacing simple sugars and other unprocessed sweets with blended, juiced, or steamed fruits, vegetables, and berries. It might not be bloating. If you feel better after you poop, it might just be constipation. Gas can actually get trapped behind poop. If you just eat more fiber, you’ll help that poop move through faster. Then, the gas will be free to flow out. You need to increase your fiber slowly. If you eat a lot of fiber after not having done so for awhile, it could actually make bloating worse. There are ton of high-fiber foods that taste great. Think about replacing white bread with whole grain bread, eating more berries, and making fruit smoothies at home. There’s a scientific reason why stress could be making you feel bloated. When we’re stressed, our brains direct blood away from our normal digestive process. While you could have a stomachache or constipation, you could also get bloating. So, tone down the stress. There are myriad anti-stress remedies. If you’re feeling bloated and having other digestive issues, consider working on your stress and not just your diet. 4. You’re eating too fast. Don’t chug that beer and gobble up that steak so fast. You could bring on the bloat. Make sure you chew, chew, chew your food. If you don’t chew your food well enough, it can impair your body’s ability to digest it. So, force yourself to chew really thoroughly and take small sips. Just stop chowing down at supersonic speed, OK? 5. You’re not drinking enough water. So many health problems are caused or exacerbated by not drinking enough water. You’ve gotta load up on water at your house, get a work water bottle, and do whatever you have to do to have water near you at all times. Most people are dehydrated just from the coffee, sugar, and alcohol they consume. If you’re eating and drinking that stuff, then you’re probably really dehydrated. Everyone needs to be drinking at least six to eight glasses of water per day. When you don’t have enough water, your body holds onto the fluid it does have. If you’re retaining fluid, you can feel bloated. So, you actually need to drink more so you don’t drink as much of it.